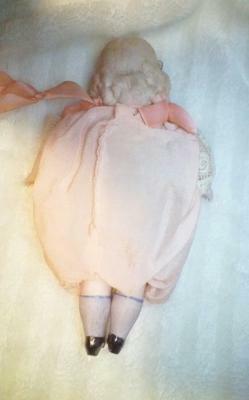 I received an antique doll from the family of an elderly neighbor who passed away. This lady was born in 1900, was somewhat of a recluse and never got rid of anything. 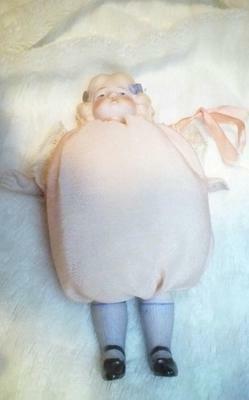 This doll is approximately 6 inches long and is made of what appears to be china from her head to her feet. Her arms and legs are jointed and are attached with string. Her features, knee socks and hair bows - which are each two different colors - are all painted on. She is wearing a peach colored poufy non-removable dress which gives her a pumpkin shape. She bas a matching attached ribbon attached to the top back of her dress which makes her seem to be an ornament. She has chunky calves (like me! )and semi-pointed mary-jane shoes. I tried looking on her back for a mark but would have had to rip her dress. I took out a few stitches down to her neck but couldn't find anything. I have searched the internet for something that looks similar but have had no luck.